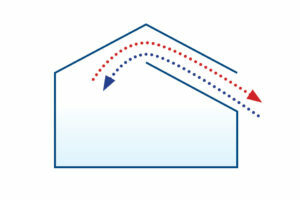 This graphic shows how net water vapor is removed when one uses ventilation as a means of dehumidification. The continuous cycle of removing net water vapor and adding heat during ventilation makes it an energy-intensive method of dehumidification. 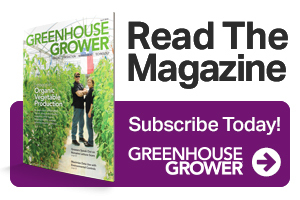 The best defense against fungal infection for high-value, susceptible greenhouse crops is to create environmental conditions that promote a healthy, dry crop that is also hostile to fungal proliferation. This means controlling temperature and humidity so water is not accumulating on the tissue. The dangerous hours occur when the sun goes down. A cooler night sky is the driver for glazing to become cold and for plants to radiate to the cooler glazing. When the glazing/covering or the foliage reaches the dew point, wetness will occur. Effective strategies for avoiding dew point conditions are to use overhead screens/curtains, which will slow plant radiation cooling, and to actively dehumidify the air using one of three techniques: ventilation, condensation, or desiccant dehumidification. Ventilation is the most common tactic, but it offers the lowest level of control/effectiveness and is the most energy intensive. Air is heated so it can hold more water vapor, but when the upper limit for both temperature and humidity are reached, indoor air is exchanged with cooler, drier outdoor air with either vents or exhaust fans. 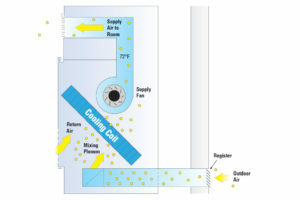 During condensation, air is drawn across a cold refrigerant coil and water condenses and drains away. The challenges with this method are that saturated conditions are created inside the cabinet, which allows bacteria and mold to flourish. When ventilation is used, the cooling that is brought in must be compensated with heating to maintain temperature. Interestingly, heating, especially when delivered beneath the crop, induces the plant to transpire. In fact, about 40% of the energy that is delivered beneath the canopy to help control humidity is immediately converted by the plant into water vapor. So there is an escalating relationship or continuous cycle of ventilating, heating, and resulting transpiration. This makes ventilation an energy-intensive method and creates the limitations of humidity levels that can be achieved. Condensation happens on the underside of a cold roof. Single-paned glass greenhouses of yesterday were energy intensive, but rather dry, owing to a great area of condensing/dehumidifying surface. The greenhouses that we use today with multiple-wall glazing and screens/curtains dehumidify less, owing to a warmer interior surface, and therefore we struggle more to control humidity. Condensation is also what happens inside conventional refrigerant and compressor-based air conditioning: Air is drawn across a cold refrigerant coil and water condenses and drains away. The challenges with this method are that saturated conditions are created inside the cabinet and this, combined with a food source like soil dust, allows bacteria and mold to flourish and then be distributed throughout the canopy on the air stream traveling across the coils. This, along with the electric energy intensity of operating a refrigerant compressor, has limited the adoption of conventional air conditioning and heat pumps. Conventional air conditioning involves air coming into contact with liquid desiccant, which can lead to the development of water vapor and mold spores that can infect plant tissue. 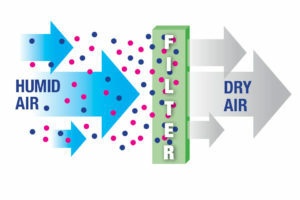 Desiccant dehumidification employs a chemical method whereby water vapor is absorbed by a material such as a salt. Energy is then required to regenerate or dry the desiccant. The Israeli company Agam has created a synergistic, liquid desiccant dehumidification system that works with the knowledge that convection and transpiration are linked and addresses the greenhouse/plant dynamic in a matter that is very energy efficient. The energy that is needed for desiccant regeneration is borrowed, and the latent heat that is used in both the dehumidification and desiccant regeneration process are given to the growing zone, offsetting heating demand. This method reduces annual energy consumption needed for heating by about 60% compared with ventilation, while offering a greater level of humidity control. Kurt Parbst ([email protected]) is Director of Business Development at Envirotech Cultivation Solutions in Richmond, CA. See all author stories here.